Nagra: the military, movies, spying – and serious hi-fi | What Hi-Fi? In high-end circles Nagra is one of those brands that people speak of in hushed tones. Its formidable reputation is built on premium recording equipment for the broadcast and film industries and continues to be strengthened with a range of domestic high-end digital and amplification components. Stefan Kudelski founded Nagra (it's a Polish word that means “will record”) in Switzerland in 1951. At just 22 years old, he developed a small, high-quality tape recorder and named it the Nagra 1. It was a compact portable unit, mechanically driven by a spring, with battery power for the valve electronics. There was nothing else available to the broadcast industry that was so light and compact – let alone something that made such good recordings – and it was truly revolutionary, making audio recordings in all sorts of remote locations a practical option. The Nagra 1 was an immediate hit, and was quickly followed by more developed products in the form of the Nagra II and III recorders. These units sold in the thousands and established the brand as a major player on the audio side of the TV, radio and film industries. The movie industry has shown how much it values Nagra’s products by awarding the company two Oscars - in 1978 and 1991 - for its contribution to soundtracks. There aren’t many specialist manufacturers that rival that. Nagra has long made equipment for the military and security industries, alongside recording equipment and home audio. In the company’s headquarters we saw early miniature tape recorders; the type that will look familiar to anyone who has seen episodes of Mission Impossible from the 60s. Also on display were a number of prototypes, including a very early portable video recorder made years before the likes of VHS and Betamax. 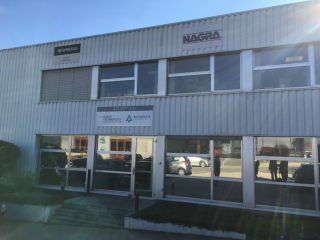 Nagra’s headquarters are based in an unassuming industrial unit in Romanel-sur-Lausanne, Switzerland. We start our tour in the R&D department and are shown prototypes of the recently introduced range-topping HD preamplifier and its partnering outboard power supply (coming in at around £50k for the pair). The company has come up with clever solutions that help to reduce distortion, drop the noise floor to below an astonishing 160dB and reduce interference. There’s also an innovative volume control circuit that is claimed to avoid the shortcomings of traditional potentiometers – namely that such components throttle back the signal rather than make it louder, so degrading transparency and dynamics. The motorised Alps Blue potentiometers used in the preamp are there only to sense the movement of the front panel volume controls and then send a signal to a sophisticated transformer-based circuit that does the job of changing levels. Nagra is a relatively small company with a staff of around 25 - fairly typical of a company such as this. While all the circuit boards are designed and engineered in-house, subcontractors are used to build the sub-assemblies and populate the boards. But there are many things Nagra prefers to do itself, just to get the results spot-on. We came across a very skilled and patient worker adding tiny surface mount parts to a power supply circuit to fine–tune the results. The company’s range is made up of a mixture of transistor and valve-based products. It takes great care to ensure the consistency of the valves used - no easy task, thanks to the variable quality of manufacture even from the best of suppliers. Nagra finds that more than half of the valves delivered fall short of its high standards, despite the fact that it, naturally, is buying some of the best-made valves on the market. Nagra prides itself on the quality of its transformers. These are all built in-house to meet the company’s exacting standards. We’re shown the transformer winding room and the impressive range of designs the company makes. The brand is obsessive about quality. Each sub-assembly is tested and, once a product is completed, it is heavily tested and thoroughly checked to ensure everything is as it should be. Complete records of every product it makes are kept, and every unit shipped includes detailed documentation and performance graphs of the actual product bought. Once fully built, every item manufactured is soak tested for a further four days to ensure reliability and complete the initial phase of running-in. Nagra products tend to keep working for decades thanks to care taken in manufacture and the quality of materials used. The company prides itself on keeping as many spare parts as possible to ensure owners of older equipment can still enjoy it for years to come - estimating that its storeroom has upwards of 30,000 lines of parts. We end the day by enjoying the brand’s reference set-up in a dedicated listening room. The system uses a full range of the company’s products, including digital recorders, the HD DAC, CD player and reference pre/power combination. The speakers are the Lohengrin II by Canadian brand Verity Audio. The total system cost is around the £250k mark. Listening to original master recordings - made on Nagra’s own products, of course - we’re struck by the stunning clarity and realism. It’s an astonishingly expensive set-up, of course, but the performance and build quality are little short of breathtaking. Such quality has its price. Are these the best-engineered turntables you can buy?